Is Votiva Right for You? Take this quick and easy questionnaire. Do you notice vaginal discomfort? Are you experiencing urinary problems? Are you experiencing menopause or perimenopause symptoms? Suffer from low estrogen? Do your symptoms affect: sleep, activity, athletics, travel and social activities? Are you experiencing dryness, itching, discharge, odor, irritation, tenderness? Contact us today at 728-388-6982 Ext 301 or 302 to schedule your Consultation and find out if Votiva is right for you. Before beginning treatment, we will apply a topical numbing cream the areas to be treated to ensure you remain comfortable throughout the procedure, although you may experience moderate discomfort. You may also take Tylenol 650 mg 2 hours prior to treatment. Quite possibly the best benefit of this procedure is that it is completely noninvasive. 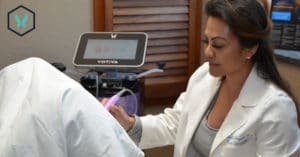 However, keep in mind that by undergoing skin resurfacing with Fractora, you are receiving a treatment that is much more advanced than traditional skin resurfacing lasers. It is even safe and effective for ethnic skin. The number of treatment sessions depends on the individual patient and is typically 3 monthly sessions, 4 weeks apart. Depending on the intensity of the treatment, there is little to no downtime. Most patients may have slight discomfort during and immediately after treatment. Some patients will experience no discomfort at all. Your physician will determine the number of treatments right for you. The majority of patients have 2-3 sessions, however, most notice a difference after only 1 treatment.